Not many household bathrooms are designed to accommodate mobility handicaps. Consider this list of renovations to create a handicap-friendly bathroom. Most household bathrooms are not designed to accommodate mobility handicaps. Bathrooms are traditionally small. 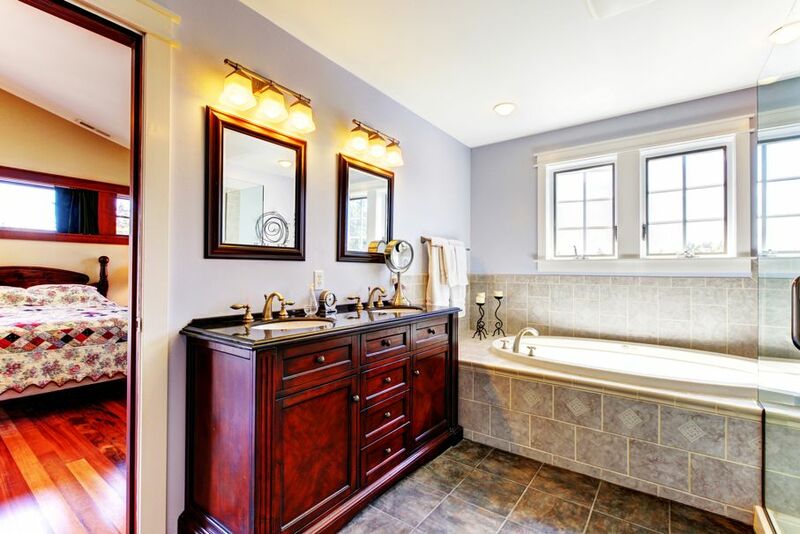 In many cases, the toilet and sink are only a foot or two apart. Maneuvering a wheelchair in a space that size is virtually impossible. In addition to the space issue, the bathroom needs to be specially equipped with railings and handles to make it practical to use. These adjustments are necessary whether the handicapped person plans to use the bathroom independently or not. Even if they are being assisted while sitting on the toilet or climbing into the shower, they will need extra ways to brace themselves and help you support their weight. If you are handicapped or living with someone who is, renovating your bathroom to be handicap accessible will save you a lot of hassle. Consider this list of adjustments to make your life a little easier. Access is the biggest task in a renovation like this one, but it doesn’t have to be complicated. At the most basic level, you can install railings at the edge of the countertop and along the walls of the bathroom. This way, if the wheelchair is unable to fit inside, the wheelchair user still has something to support them as they go in. Sometimes, you can open up more space by knocking a new, wider entrance through one of the existing walls. This option is particularly useful if the hallway through which you access the bathroom is skinny. Lastly, if you have the means to widen your bathroom, plan a 4-foot wide path down the center to accommodate a standard wheelchair. If you only need to make room for a walker, then a 3-foot wide path will do. Shifting things so as to create a wider path can be very difficult, so you should only use this option as a last resort. In a handicap accessible bathroom, every inch of floor space must be justified. If you have a floor-mount sink, consider swapping it for a wall-mount sink and separate cabinet. When the bathroom is going to be constantly used by someone in wheelchair or walker, other small furnishings like hampers and stools should be removed. The more room there is, the easier it will be to move around inside and the less dangerous it will be to fall. If someone will be coming in supporting themselves on side railings, covering the floor in soft carpeting will provide a gentle cushion just in case they take a fall. If you plan to install a new bathtub, select a design based on accessibility. If a caregiver will help with the bath every night, consider a bathtub on a raised dais. These designs sit high enough the caregiver will not be hunched over as they assist with the bath. 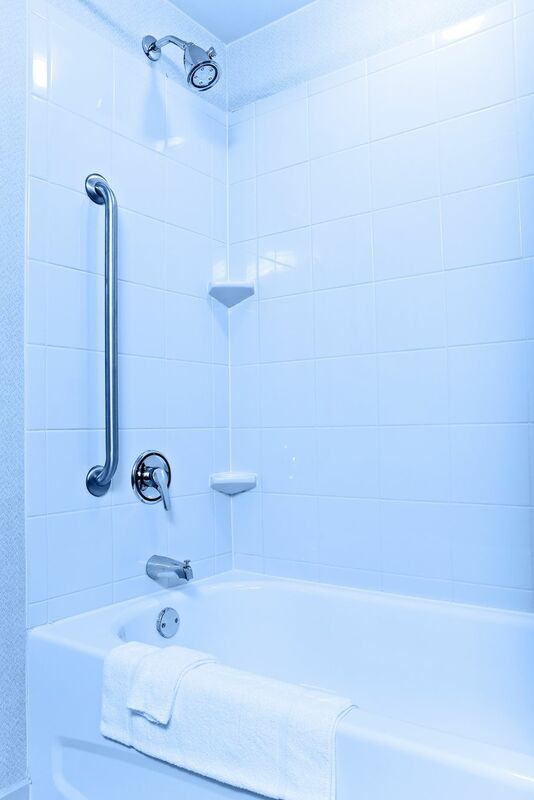 If you stick to a regular bath, the wheelchair user may need to be transferred from their chair to the bathtub. If this is the case, a design with a built-in seat or door in the side will be far easier to use. In this situation, the transfer will require the caregiver to guide the wheelchair user instead of actually lifting them. The issue with these designs is that they can be time-consuming. A bathtub with a door in the side will need to be drained completely before you can use the door to get out. 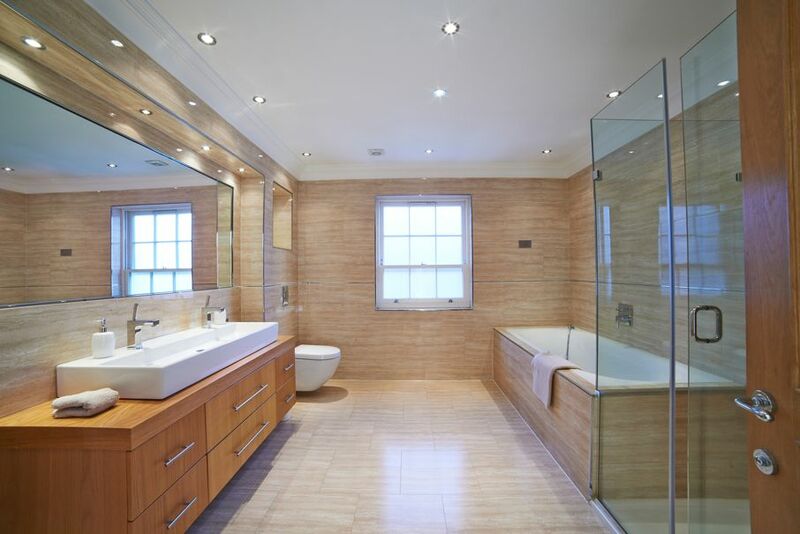 Unless you have a strong objection to lifting, regular and raised designs are more practical. 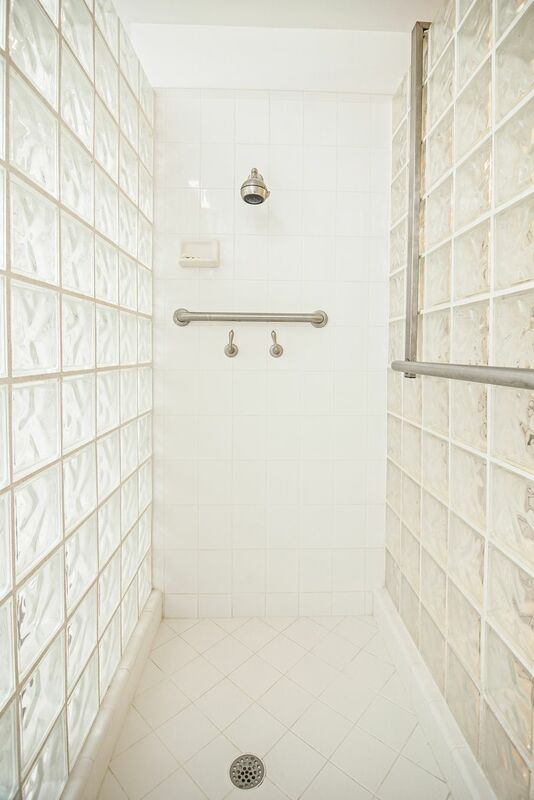 Many wheelchair users prefer showers to baths. Showers are far easier to use in a chair than baths. Some large showers even have space for a wheelchair to be pushed all the way in. Other designs come with seats if wheelchair users do not want to stay in their chair while showering. With a flexible shower head hung at eye level, the scrubbing and rinsing process are simpler this way too. In a handicapped accessible bathroom, you should be able to approach the toilet from the front and on either side. When a wheelchair user shifts their weight suddenly, they need to be able to access their chair from whatever angle they choose. They also need to be able to transfer from toilet to chair without too much effort. 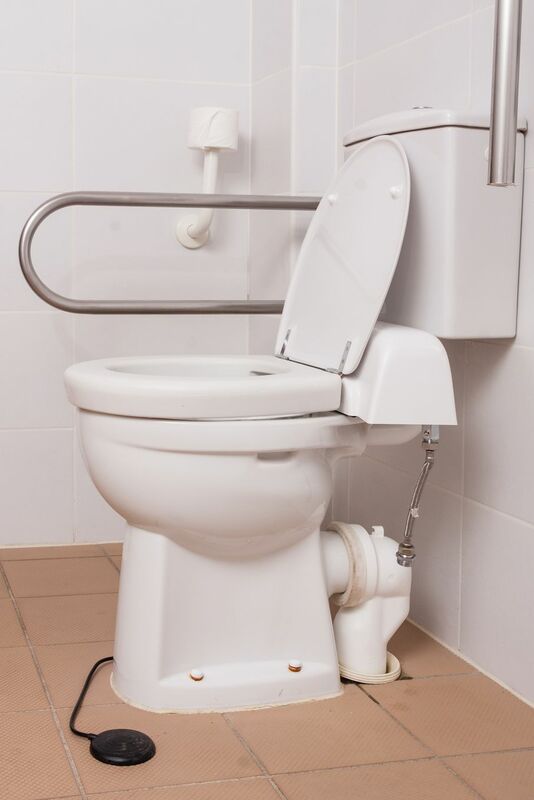 Conventional toilets sit lower than the average wheelchair, so installing a raised seat in your bathroom will help with a smoother transition. You don't have to install a new toilet to make this adjustment. Clip-on, raised toilet seats are available at most drug stores. In a handicapped accessible bathroom, you should be able to approach the toilet from the front and on either side. When a wheelchair user shifts their weight suddenly, they need to be able to access their chair from whatever angle they choose. They also need to be able to transfer from toilet to chair without too much effort. Conventional toilets sit lower than the average wheelchair, so installing a raised seat in your bathroom will help with a smoother transition. You don't have to install a new toilet to make this adjustment. 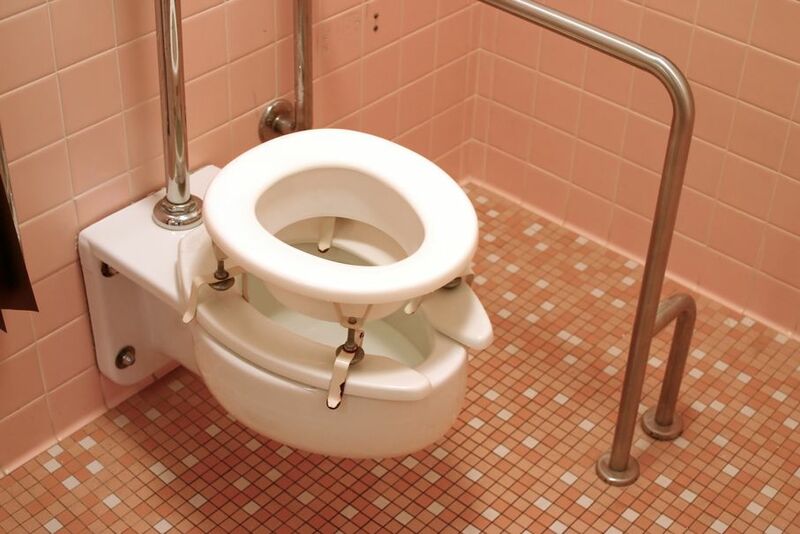 Clip-on, raised toilet seats are available at most drug stores and will make a huge difference. Designing a handicap accessible bathroom can greatly assist you or your loved ones who are disabled. These options will make any handicap person's bathroom trips more comfortable and create an environment where a wheelchair user can feel safe at home.